Here in Venice, for the first time, I find that I fall in love at every corner turned. An architecturally perfect palazzo. A canal filled with sleek black gondolas overly decorated with bright seahorses, intricate velvets and tassels. Intricate 12th-century mosaics covering the ceiling of the Basilica of San Marco. The riot of colored houses on the island of Burano. The delightful sound of a small orchestra playing chestnuts while a couple poses for their wedding photographs in Caffè Florian. A love lock on the Academia Bridge. There is a lot to love in Venice - all these wonders I had not until now experienced. I did, however, run into an old Tuscan flame while here, and it was just fireworks again from the first moment. Before you start worrying about me and Mark, you needn't; I am (of course) talking about a food item. Farro. We bought some at the Coop yesterday - a rainy Saturday - for soup. It was an “instant” variety, meaning it didn’t need to be soaked for the requisite 12 hours. Mark made a really hearty and flavorful soup with pancetta, onions, carrots, celery, mushrooms and farro. It was just what we needed on a chilly and rainy Venetian day. But I settled on two items. For Saturday evening I got octopus to make a salad with potatoes, celery, and olives. 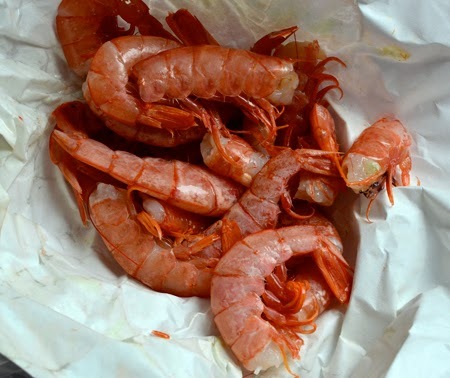 For today, I bought a pound of shrimp, assuming I would use them in pasta or risotto, but I was wrong. I suddenly had the idea to use some of the farro we had bought the day before. After searching online for some inspiration, I opened our well-stocked larder to find cream, saffron, onions, peas, and parsley (in addition to the farro). Of course, olive oil, butter, wine, salt and pepper are always around. The end result was quite wonderful; the biggest challenge was finding decent light to photograph it! I am glad I ran into farro in the market; it has been great reconnecting, and now I think Mark and I will both be seeing a lot of him in the future! Bring a large pot of salted water to boil. Add pre-soaked farro to 8 cups boiling water; reduce heat to a simmer and cook until al dente, about 30 minutes. At the end of its cooking time, season with salt; do not salt the water in the beginning or you will have very tough farro. While the farro is cooking, heat 1 1/2 tablespoons butter and cook minced onion in saucepan over medium heat for 2 minutes. 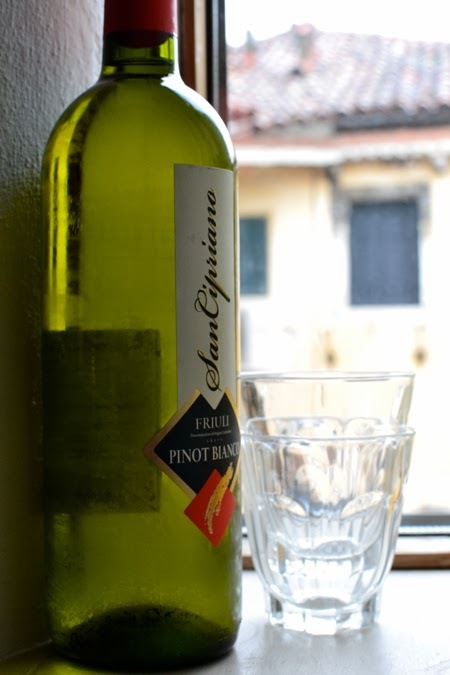 Add 2 tablespoons of the wine and cook until almost evaporated. Add cream and saffron. Cook, stirring well, for 2 minutes, then reduce to a gentle simmer and cook, stirring occasionally, until sauce is thickened - about 3-5 minutes. Season with salt. Remove from heat and set aside. Place remaining butter and wine in a small saucepan and add the peas. About 5 minutes prior to farro being ready, bring peas, butter and wine to a simmer. Season with salt and cook until crisp-tender - about 5 minutes. Heat 1 tablespoon olive oil in a large nonstick skillet over medium-high heat. Add shrimp to skillet and cook for 2-3 minutes per side. Drain farro and add to shrimp, stirring, just to heat through. Remove from heat, stir in remaining 2 tablespoons olive oil and parsley; season with salt and pepper. Reheat the saffron sauce, adding a little more cream if it has gotten too thick. 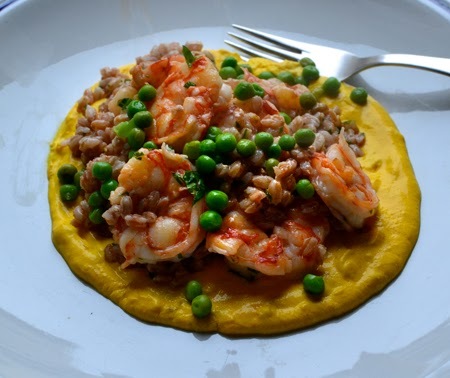 Divide sauce among 4 serving plates Spoon farro and shrimp over sauce. 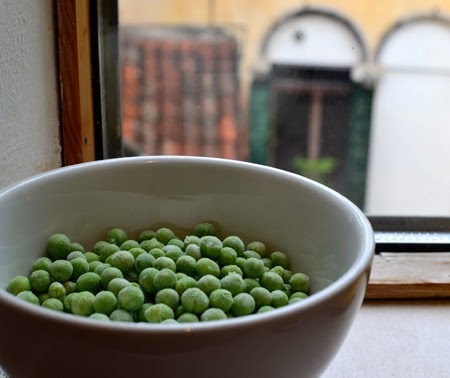 Garnish with cooked peas. Dear David, this looks like such a sumptuos meal in such a breathtaking place - I visited Venice only once, a long time ago and I was quite impressed with so many things. Beautiful photography, great natural light and fabulous food - absolutely fantastic, dear friend. Looking forward to your upcoming posts. Thanks, Andrea - I definitely look forward to returning! SO much more food to try! That looks absolutely delicious, a dream plate of food. Venice is still on my wish list! I once spent my birthday in Venice, quite the experience! So great you got to go David. Europe has so many magical places, I'd need three lives to see them. Talking about food, I don't know if I ever cooked with farro! Need to remedy that soon. I just found some wonderful saffron and this is SO my type of dish (sans the shrimp of course...). Gorgeous! 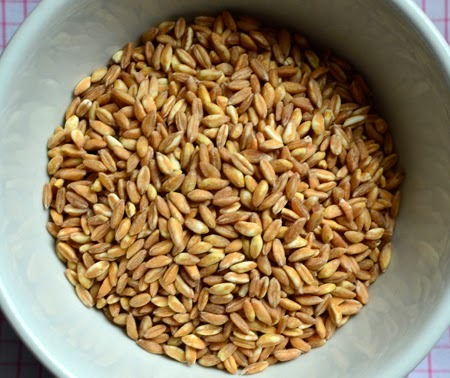 Paula - you do need to try farro - it is such a good and healthy grain, and it has great flavor. You will love the nuttiness. 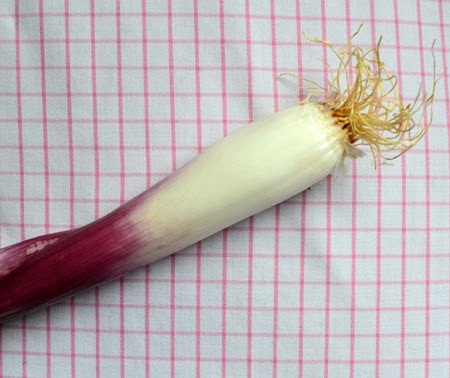 It makes for a great salad and is wonderful in soups. The "ready-to-eat" section Galen? What's that? :) I love Wegmans and wish they would move to the Southwest! 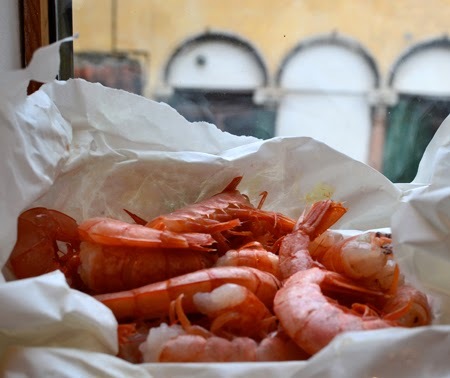 When we were in Venice, we ate at the Castegelo St'Angelo (I think that was the name). My daughter asked for a dish that would be a signature dish of Venice. They suggested a chicken liver entree and she ordered it-pretty brave for an 8th grader! It was delicious, in some sort of cream and wine sauce. I have been looking for a recipe ever since-any ideas? Definitely brave for an eighth grader! What a way to expand her repetoire, Mom! Cathy - I think your daughter and I must be very much alike! I remember going over when I was 14 with my friend Chris and his older brother - three teenagers alone in Europe for a month - and I was constantly ordering things that the waiter would try to warn us about. Liver was the most common, but I always loved every bite. The liver that is traditional in Venice is cut to the size of chicken livers but is usually calves liver. If you email me directly through Cocoa & Lavender, I can give you a couple pf really authentic recipes that are so good. Also, if you really want chicken livers, I have a great pasta recipe for those, too! Looks absolutely yummy and your photos are wonderful! Thanks for this trip down memory lane! We were in Venice in May. Try to find Il Rusteghi, tucked away off the beaten path near the Rialto Bridge. Locals go there for good wine and a light meal. Enjoy! Isn't it fun finding the places locals go, Kirsten? You will be seeing photos of Il Rusteghi in an upcoming post - we loved it! There were a few other cicchetti gems that we will share, as well. Your photos and short description of your observations really captured Venice. I can confirm that it is a magical place, having visited in the mid-1970s as a college student doing the requisite summer-in-Europe trip and as a parent in 2006 taking our daughter around some of our favorite spots in Europe. Your meal looks wonderful. By the way, not only did you find decent light, you found the perfect light--the photos are some of your best! Thanks, Susan - the credit for the "good light" is due to a new l;ens friends Lee and Lynn gave me - had I not had it, I would have been sunk... (Is that a Venetian pun?) I am so glad you like the photos and the reminder of your good time there in the 70s - you would be surprised how clean the canals are now! I am reliving my birthday last year in Venice though your post, so firstly, thank you - it's a magical place and one I can't wait to get back to. Secondly (if that's a word...) I LOVE farro! In soups, in salads, or as a replacement for rice in a risotto....BELLISSIMO! Thanks, Karin - glad you =, too, are enjoying Venice again through the post. I just yesterday found 10-minute farro at Trader Joe's - I hope it is good! Love your wonderful photos of Venice...such a special place. Your dish sounds delicious. Thank you for the tip about the salt when cooking farro...I've never cooked it but do like it. Karen - From a very young age I was always taught to salt the water well for starches (potatoes, rice, pasta) at the beginning. Apparently, with farro, you end up with really tough, almost inedible, nuggets if you do. You really need to get to Italy soon, Laura - my next three or four posts will convince you I am sure! Yes, it is far - and my theory is, "Do it as often as you can when you are young! The jet lag gets worse with every year you age! :)"
I love Venice and pretty much every other inch of Italy. I think you found the perfect light for the photos -- the butter is my favorite. And what's better than an open-air market in Italy!? Love all of this! Thanks, Valentina - I have not net an inch of Italy I didn't like, either! 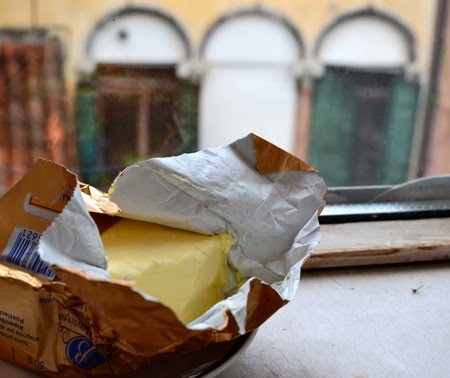 Glad you liked the butter - just about anywhere in Europe has butter that shames our U.S. butters... Almost no water content at all! 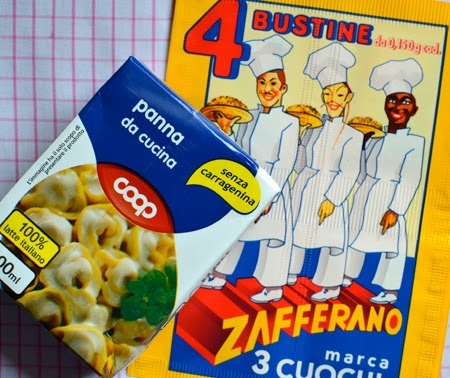 I've had a hankering to get back to Italy for a long time. It's one of my favourite countries! I've been to Venice twice now, falling in love with it more on the second visit as we kept well off the tourist path and ate at small neighbourhood eateries. I need to go back! Delicious dish, by the way. And the name Farro would be very fitting for a tall, tanned Italian man with a big beaming grin. Don't you think? I am assuming Farro would also be a gondolier, right? I look forward to my second trip to Venice, absolutely sure that I, too, will love it more the second time around. And I really loved it this time! I'm so happy to see your photos of Venice! How funny - I bought some instant Farro at Trader Joe's and John wanted to know what I was going to do with it. If I tell him we're making another one of your recipes with Saffron, I'll have no trouble convincing him to try it! I can't wait to see more of your adventure! Haha - I hope John isn't disappointed! Did you see my response to someone that I just bought the TJ's instant farro? I hope it is good! Let me know what you think, Susan! Lucky you to be in Venice! I so badly wanted to go when I was younger and still do. We got to Greece but Italy still eludes me. 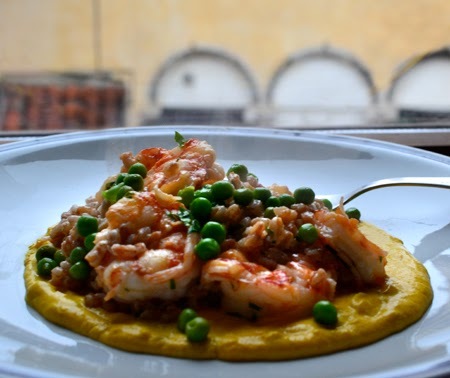 The farro and shrimp look wonderful, the colours are just beautiful. Your photos of Venice are wonderful too. Oh, Nazneen - I know you will love Italy once you get there. The hardest part is leaving! 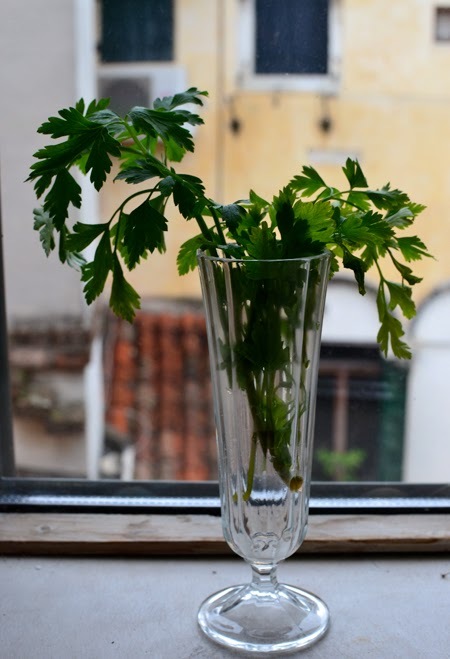 How is it that everything looks better on an Italian windowsill? We love venice. Been there twice in the last 3 years… Its a city that you either love or dont.. We love it.. We havent seen that spiraling tower. We tried to find it last year while we were there for new years but we got super lost. Are you living in Venice?? What a decadent dish, David! Venice is so lovely - we spent a couple of days there on our honeymoon years ago. Wish we'd had more time. It's great that you have the opportunity to cook while you're there. I can just imagine how much inspiration there is around you. Colette - I love cooking when we go on vacation! We always rent a place with a kitchen so I can play! Too many fun ingredients out there - it would only frustrate me to see them and not be able to do anything with them! Thanks! Anything with lots of saffron is okay by me! 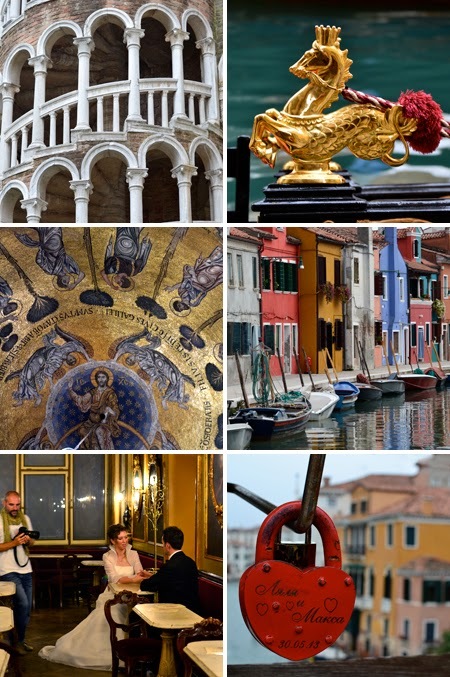 I am loving these posts on Venice David, I am of course green with envy :) Beautiful photos and you have captured a little slice of Venice perfectly! Thanks, Karen - we felt very fortunate to take this trip! Ahu - we feel the same way but about Italy in general!